Home NEWS MPs dismiss the ‘Big Brother syndrome’ exhibited by foreign envoys. MPs dismiss the ‘Big Brother syndrome’ exhibited by foreign envoys. Mathioya MP Peter Kamari ddressing residents at Kaweru Shopping Centre in Kiharu Constituency during the Presidential campaigns caravan on Monday. Several Jubilee party MPs from Murang’a County have protested what they termed as ‘undue interference’ on the part of some foreign envoys who on Monday called on the National Assembly not to change electoral laws just before polls. 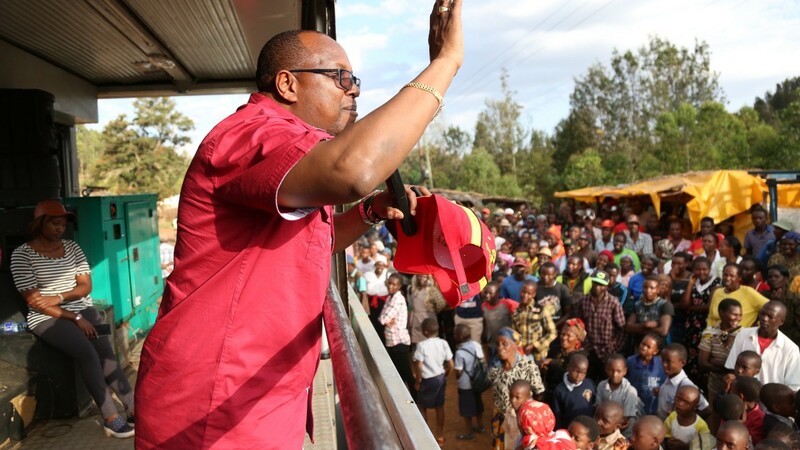 While addressing wananchi at various stops during their campaign caravan for the reelection of President Uhuru Kenyatta, the MPs took exception to the action of the said diplomats as unnecessary and undue interference in a purely domestic concern and disrespectful of the constitutional processes of their host country. They asserted that Kenya did not at all need the endorsement by any foreign envoy to man its affairs and accused them of breaching diplomatic etiquette by interfering with matters that do not involve their countries. Mathioya MP Peter Kimari said that it was wrong for foreign countries to micromanage the governance of this country by trying to dictate how the Arms of Government exercised their mandate. “The statement of the foreign ambassadors violates a cardinal rule of international relations which abhors undue and blatant interference in the internal affairs of nations. The change on election laws are being done to ensure we correct the errors that were sighted by the Supreme Court as they annulled the August 8 presidential results and for the prosperity of the nation,” said Kimari. Kiharu MP Ndindi Nyoro described the envoys’ action as poking their noses into Kenyan sovereignty. “Their statement is truly lamentable and puts into question the motives of these envoys. It was done in a manner orchestrated to put pressure on us to act in a particular way which is unacceptable,” said Ndindi. He accused the envoys of working in cahoots with NASA in frustrating parliament not to amend the laws adding that the MPs will not retreat on the changes. Gatanga MP Eng. Ngugi Nduati called on NASA MPs direct their complaints to parliament adding that the assembly had formed a committee to receive such complaints. He castigated yesterday’s demos that led to death of one person in Siaya pointing out that it was very wrong for leaders to purport to fight for leadership at the expense of the lives of innocent youth. The MPs were reacting to a statement issued by the foreign missions mainly from Europe and America who criticised the Jubilee government for introducing amendments to the current electoral laws, terming it as undermining IEBC preparations.